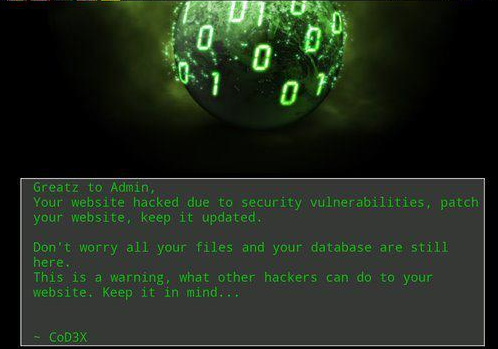 The Government’s parliamentary website, www.ttparliament.org, was taken offline yesterday after a computer software hacker apparently breached the security codes of the site and left a mischievous message announcing the security break. Under the name "CoD3X", the hacker reassured the parliamentary site administrator that all the files and the system's database remained intact. Minister of Government Business and Acting Attorney General Dr Roodal Moonilal, though, was not concerned with the breach and in fact denied that the Parliament site was taken offline to deal with that specific issue. Corporate communications manager, Jason Elcock, yesterday confirmed the attack and stated that information system technicians and the website’s service provider FLOW were currently working to determine how the perpetrator hacked the site. “What we are aware of is that our home page was replaced with another page and so persons visiting the site would not have been able to see our page. None of the data was affected, but we are doing the necessary security checks to ensure that when we put it back up we won’t have a repeat of that problem,” he said.